Winnie is horrified when tycoon Eros seeks to legitimise his hidden heir. Swept away to his Mediterranean villa, she’s overwhelmed by the fire still burning between them. But can she accept her new role as his convenient wife…? By the time Theodora realised she was pregnant, her marriage to Aristotle was already over. Since then, she’s zealously guarded her secret… Until Aristotle discovers his heir—and demands Teddie marry him again! A hotel mix-up means Sabrina shares a room—and an electric night!—with her nemesis, Max. They’ve always battled their chemistry, so when Sabrina confesses she’s pregnant, she’s stunned by Max’s demand to wear his ring! Finding herself incognito and captive on Alexei’s private island, Princess Mina must convince him she’s his future bride. But after a night in the Greek’s bed, there’s more at stake than her hidden identity—her heart’s at Alexei’s mercy too! 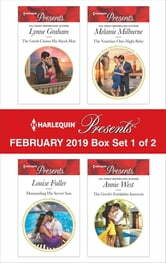 Be sure to collect Harlequin® Presents’ February 2019 Box Set 2 of 2!